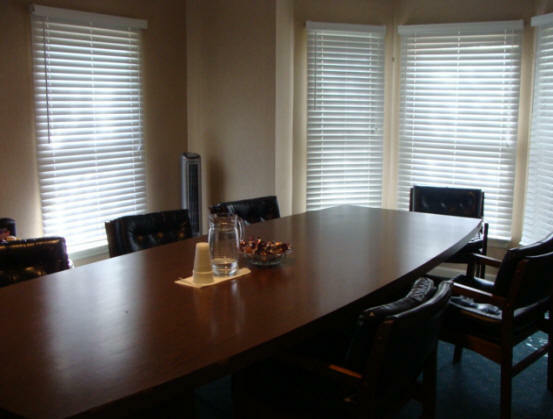 We offer a conference room available in our Fayetteville Office with state of the art conference telephone for your depositions or EUO. Our conference room easily seats eight to ten people. We have an onsite kitchen for refreshments, provided by Starkings Court Reporting while you're visiting our offices. We also offer concierge service to and from the airport or your local hotel. See our links for hotel locations nearby. We are approximately 15 minutes from the Fayetteville, North Carolina Airport, and will be glad to pick you up and return you for your flight home. Please call to make arrangements for this service. "Now offering Video Conferencing in our Fayetteville conference room."